Sam and Cody have settled into married life, live in their dream house, and are more in love than ever. There is just one thing missing from their lives to make their home complete. A baby to share their love with. Adoption is hard enough, but the struggles and hardship of trying to adopt as a gay couple may be too much for the men to handle. 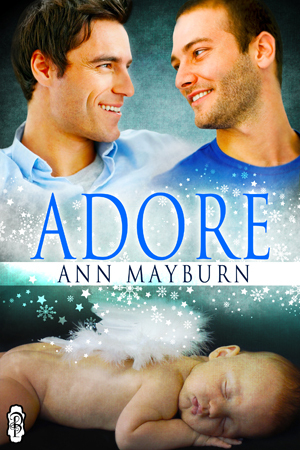 When a series of setbacks leave both men with broken hearts and wounded souls, it will take a Christmas miracle to give Sam and Cody the strength to give adoption one more try. Sam Dunham tried to keep from laughing at the scolding look their distinguished lawyer gave him and his husband, Cody McPherson. Arthur Mulberry, their adoption attorney, leaned forward on his gleaming glass-and–stainless-steel desk and adjusted his glasses. Sam and Cody exchanged an amused glance. Arthur tended to get a bit dramatic but they were both used to it. Hell, in the past year they’d been going through the process of trying adopt, and they spent more time on the phone with the lawyer than they did with their parents. But all of that was about to change because they’d finally been matched with a young pregnant woman, Nancy, due to give birth any time in the next few weeks. Five months ago Nancy had picked them as the adoptive parents for her baby and they’d been living in a state of joyful anticipation ever since. That was true. In the four years since they’d been married, the exotic stone business they owned had grown exponentially, to the point where they now had over twenty full-time employees and enough money in the bank to do pretty much anything they wanted. Like afford Arthur’s three-hundred-and-fifty-dollar-an-hour attorney fee.